The stars along the northern Milky Way rising in the eastern sky. To the right lies the Hyades above which is the smaller Pleiades star cluster. To the left of center in this image lies the constellation Auriga, the Charioteer. Visible nearly overhead in the northern hemisphere, the bright constellation Auriga makes for pleasant viewing this time of year. The constellation, which looks like a big hexagon about 15° across, sits in a fine star field along the northern Milky Way directly opposite the much richer sky near the galactic center in Sagittarius. Auriga also holds the dazzling star Capella, the most northerly first-magnitude star in the skies. The constellation is also visible above the northern horizon from most populated parts of the southern hemisphere. Whether you have a pair of binoculars or a small telescope, make an appointment to examine the three finest open star clusters of Auriga– M36, M37, and M38– along with a smiling asterism embedded in the stream of the Milky Way. These three bright Auriga star clusters are about 4,200 light years away, but they are otherwise quite distinct from each other. All lie within a single field of view of a pair of 7×50 binoculars. M36 is the smallest and youngest of the trio, and, with optics, presents a lovely arrangement of blue-white stars. The cluster lies within the hexagon of Auriga just northwest of the mid-point of the line between Alnath and θ (theta) Aurigae. The cluster comprises a loose group of about 50 stars. Moderate magnification in a telescope opens the cluster up nicely for inspection. The edges of the cluster are not well defined, and streams of blue stars appear to arc out from the center like the arms of a distorted cross. Just two degrees northwest of M36 lies M38. It forms an equilateral triangle with Elnath and ι (iota) Aurigae. The cluster is about 0.3o across, some 1/3 larger than M36, but it’s also half a magnitude fainter. 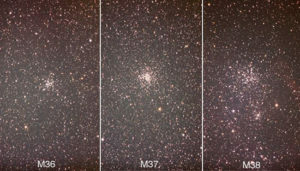 There appear to be twice as many stars in this cluster as M36– about 120 stars– and the cluster is much older than M36, so there are fewer blue-white stars here. At 75x, you’ll see about 60-80 stars of magnitude 8 and fainter. Like M36, the boundary of the cluster is ill defined. There’s an odd-looking void near the center of the cluster. And there appears to emanate a ragged cross from this void, with the long arm running west-southwest to east-northeast. Higher magnification brings out more stars, perhaps 80-90 total in a 4-inch scope. If you can manage 70-80x with a one degree field of view, you can also see the smaller and fainter cluster NGC 1907 just south of M38. The open star cluster M37 is the brightest of the three Auriga Messier objects and by far the most striking. It lies just outside the hexagon of Auriga, about as far outside the hexagon as M36 lies within it. The cluster presents a rich spray of faint stars clumped around a glorious central 9th-magnitude red-orange star. M37 makes the “best-of” list of many experienced stargazers. For dramatic effect, when you tour this part of the sky, look first at M36, then M38, and end with the magnificent M37. An annotated image of Auriga showing the major stars of the constellation and the star clusters M6, M37, and M38 along with the ‘Chesire Cat’ asterism near M38. While even binoculars can nearly resolve M36, M37 is far tighter and only shows its character in a telescope. M37 is much more compact than M36 or M38… the bulk of the stars lie within an apparent diameter of 15’ (1/4 of a degree). In a small scope, M37 looks like a loose globular cluster, perhaps a little like M22 in Sagittarius. As M37 lies at the same distance as the other two clusters in Auriga, the apparent richness of the cluster is real. There are nearly 2,000 stars here all told, though you can see perhaps 200 with a 4-inch scope. M37 is most dramatic not only for its stars, but also for its dark lanes that appear to wind through the cluster. Defocus your telescope slightly to accentuate these dark regions, and relax your eye as you follow them in and around the rich field of stars. Some claim to see the outline of a spider among these stars. And what about this smiling asterism? Look with binoculars or a finderscope towards the cluster M38. Here you’ll see a broad arc of stars about 2° wide with two ‘eyes’ immediately to the northwest. This is the ‘Chesire Cat’, a group of unrelated stars that may put a smile on your face on a clear and chilly night.